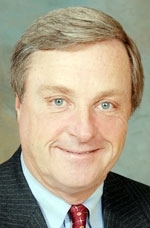 Tim Doran is president of the Ohio Automobile Dealers Association and chairman of the Automotive Trade Association Executives. Tim Doran, president of the Ohio Automobile Dealers Association and chairman of the Automotive Trade Association Executives, wonders how GM intends to save itself by cutting nearly half its dealers. I am extremely puzzled by the dealership cutbacks considered a solution to problems facing the auto industry in general and specifically to General Motors. GM CEO Fritz Henderson has a goal of reducing dealer count at GM from 6,246 dealers to 3,605 dealers by 2010. That sounds impressive, but what will it do to save GM? Closing dealerships won't affect the bottom line for any manufacturer positively but will negatively affect thousands of independent businesses, their employees, their customers who rely on them for sales and service and the communities that rely on those dealerships. The most important question is not how many dealers there are but whether the dealers are a cost center for their respective manufacturers. Clearly, they are not. A study by Casesa Shapiro Group found that dealers provide their manufacturers with a vast distribution channel, at virtually no cost.  Pay for vehicles before they leave the factory.  Pay for parts before receiving them.  Pay the wages, benefits, payroll taxes and training costs for their employees.  Pay their own real estate costs, such as land, buildings, insurance and taxes.  Pay their own IT and computer costs.  Pay their equipment costs, such as service department lifts, tools and diagnostic equipment. Dealerships equal revenue to manufacturers, not costs. Dealerships generate more than 90 percent of manufacturer revenue. A rapid reduction in dealership numbers would cut more manufacturer revenue and market share and do nothing to improve the manufacturer's viability in the short term. Even GM executives admit it takes 18 months to regain market share when a dealership closes. And that's a best-case scenario. Trying to eliminate dealerships beyond the already systematic consolidations that have taken place for the past 60 years will hurt the hardworking employees of those dealerships and their families. Also hurt will be the communities that rely on the taxes generated by those dealerships, the related businesses that sell to those dealerships, the consumers who are served by the competition and convenience of the dealerships and the charitable organizations that benefit from dealer support. When a dealership closes, the loss to the community is real and immediate. It is unnecessary to pick a random number of dealerships as if it's a magic cure. It's just an effort to deflect criticism from the manufacturers' own poor performance and failure to control costs, which is a result of their own decisions.